Pic(k) of the week 39: Living in the bush! In less than 18hrs, I should be on my way to the next photo adventure. I'm planning to spend two weeks with my wife, living in the bush on a combined holiday and photo-safari. Our initial destination is Windhoek, Namibia, where we will pick up a Toyota Hilux with a rooftop tent. From the capital of the old South-West Africa, we will leave on a +3500km trek around the Namibian wilderness. Our brief itinerary goes like this; Windhoek, Okonjima, Waterberg, Etosha, Damaraland, Skeleton coast, Swakopmund, Sossusvlei, Namib desert, Windhoek. This is my second photo-safari after the 2008 Kenyan edition. The image above was made on that trip as we were following 2 female lions who were about the catch a Zebra. 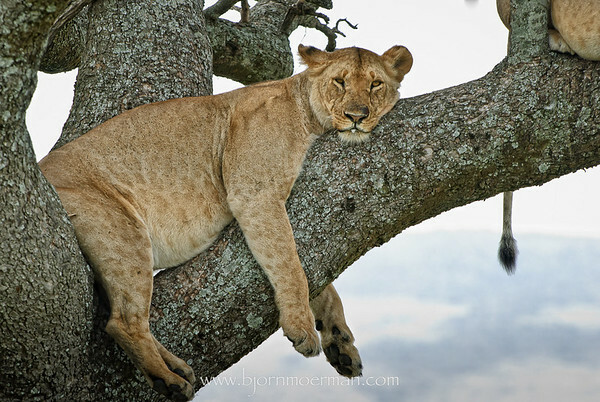 The lions must have been upset with our presence since they decided to climb a nearby tree and rest for a while. The zebra on the other hand, is probably still thankful today! More images of our previous Kenyan safari can be found here. Notice that I'm not taking a very long lens with me... I'm sure I'll be missing out on some far away wildlife shots, but I'll try to bring you a different perspective to wildlife photography! On July 25, 1909 the French aviator Louis Blériot was the first to fly an airplane across the English Channel. It took him 38 minutes to fly his Blériot IV from Les Barraques near Calais France to a little field close to Dover, UK. Interesting enough the British Customs officials did not have any provision for landings other than by ship: Blériot was logged as a ship’s master and his aeroplane as a yacht. After all it was the first international flight over water by an aeroplane! Anyhow, Carlson's personal Blériot IV story remains an amazing one... After a 10 year search he found an original Blériot in a small barn in Sweden in 1986. The aircraft was completely dismantled and stored in small boxes. After a lengthy work of love, dedication and rebuilding a lot of the parts, he managed to fly his bird for the first time in 1991. He found a second Blériot XI in Sweden in the early Nineties. 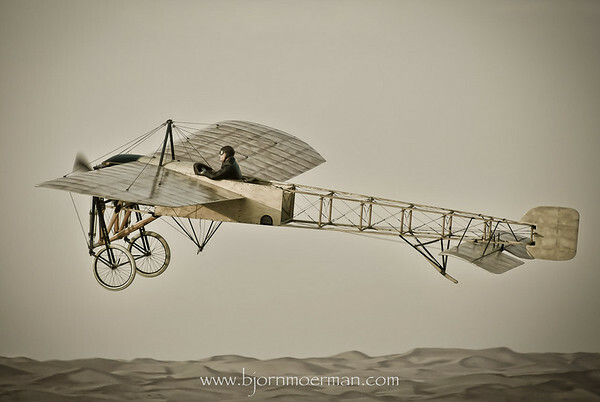 Some parts, including the engine, were missing and although he was able to copy parts from his first Blériot, it took him 10 years to find the engine. The restoration work was finished in October, 2004. He now had two flying Blériot's! 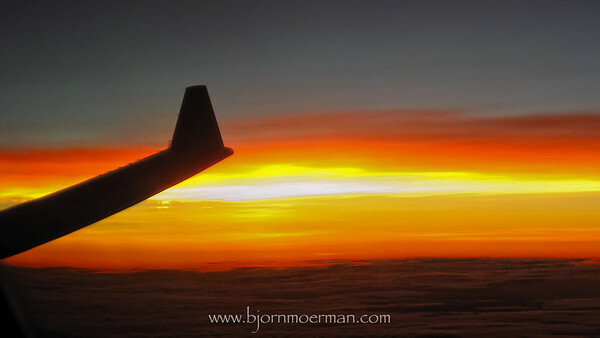 This is probably the main reason why the image above will be on the cover of my new book: "Focus on Aviation". The book is a third one in a series after Focus on Architecture and Focus on the World Below and will be available by the end of October 2010. Back to the image... I like the fact how it gives an almost painterly antique feeling to the main subject. Very appropriate for this part of aviation history! Now that the work on the book is coming to an end, I'll have to concentrate on the final preparations on our upcoming African Safari next week... More on this in a few days! Last but not least... talking about aviation adventures; follow the progress of the Flying Juniors, 3 young Belgians who are flying a single engine homebuilt aircraft around the world! As I write this post, they have just arrived in Bangkok, Thailand. Pic(k) of the week 37: Gentlemen you have a Race! "Gentlemen, you have a Race", are the famous words of every race start at the Reno Air Races in Nevada, USA. The anual event which is held while I'm writing this post (43rd edition), is unique in the world and surely a must see for all aviation enthusiasts! Several different classes of aircraft race each other around pylons in the desert. The image below, dates back exactly one year and was made as I attended the 2009 Races. The aircraft featured is "Rare Bare", a highly modified Grumman F8F Bearcat which has been competing at Reno since 1969 and has won several Gold Races in the Unlimited class. It also holds the tittle for the fastest single prop driven aircraft with a speed of 528mph or 850km/h. This is as fast as an Airbus A320 and just a tiny bit slower than the A330 and A340's I fly! Amazing for a basic airframe which is more than 60 years old! I've re-edited the image together with about 100 others, while I'm working on my next book, "Focus on Aviation"... more on the project in about a months time! Nikon D700 with the Nikkor 70-200 2.8. 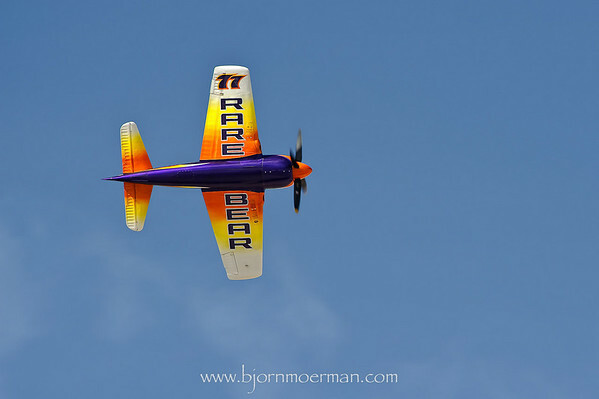 More of my images made at the Reno Air Races last year can be found here. Pic)k) of the week 36: A tribute to Doug and Matthew! Exactly one week ago you guys started work in the late afternoon of Friday September 3rd at the North side of Dubai International airport. The plan was to take a Boeing 747-400 on a +six hours cargo flight to Cologne, Germany. I'm sure you were both looking forward to leave the hot and humid Dubai behind you and head off to much cooler central Europe! The sun was setting while you were preparing the flight-deck of UPS 6. It was a nice evening and It looked like another uneventful flight was about to unfold. What a great job all us pilots have!? Ironically, I was reading flight safety reports on my iPad when I heard you guys coming overhead my home at Dubai Silicon Oasis. A villa compound housing about 500 pilots. We are used to seeing aircraft which come overhead at a few thousand feet, but nothing like this. I stormed outside the front door, just in time to see you guys flying away at a scary low altitude of about 200 to 300 feet. Oh boy, you were flying low! I immediately realized something was seriously wrong! Only a few seconds later the end was near. A huge fireball which we only see in movies! We might never find out if you boys avoided our housing complex and the surrounding high rises on purpose or whether you were by now unconscious. I kind of hope for the latter. What is obvious is that an even bigger disaster had just been avoided. It was only the following day that we learned that your mighty jumbo crashed inside an army camp and destroyed part of the buildings that happened to be empty because it was a Friday! (Friday equals Sunday in the Gulf). Lets hope that the final investigation report will answer some of our questions and that lessons will be learned! May you both Rest in Peace! PS: A few days ago, I operated a flight from Jeddah to Dubai. As we passed through Bahraini airspace, we passed an opposite traffic, "UPS 6" from Dubai to Cologne. We landed in Dubai at 1945. Exactly the time when your watches stopped working forever! A very strange feeling... The idea of a tribute post was born. Even though this is not a Aviation blog, I do hope this post is found appropriate for the dramatic circumstances of last week. September 3rd is now engraved in my memory forever! To all family members or friends of Doug and Matthew reading this, my sincere condolences! Last Sunday, I spend a few hours in Saint Paul de Vence, a French medieval village, 15km inland from Nice. Nevertheless, I tried bringing some of the French Riviera atmosphere to my images. I hope these three men playing the ballgame petanque on a small square are a great example of what I tried to achieve. All of my Saint-Paul de Vence images can be found here.